What can I say? I LOVE mid 90s metalcore! Method reigned from Milwaukee, WI, and were creating some pretty wicked riffs for the era. Living on the West Coast, I never really gathered a ton of information on these guys, but my friend Parker helped fill in a few holes when I saw him a couple of years ago here in Portland. Apparently one of Method's guitar players had a nickname of Survivor, which he gained by riding a bike across state lines to attend a hardline gathering. The same guitar player also served briefly as an original member of Killtheslavemaster. 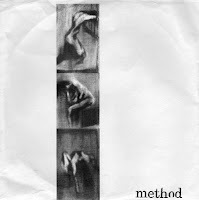 I got Method's 5 song cdep from my friend Sam, who ran a straight edge distro (both music and shirts) out of Spokane in the mid 90s. It seemed as though their follow up 7" really flew under the radar even more than their cdep did. However, I ordered this through the Initial Records catalog in 1997. I really miss the Initial print catalog. I used to order just about anything from that catalog that had a pentagram next to the record title. This 7" has two songs. From what I've been told, this is all that Method released, aside from a poor sounding demo that I still haven't managed to ever get my hands on. i remember them...i was going through all my old slipcase cds the other day as saw that... it was pretty neat from all that i remember about it. Survivor ended that bike ride (that takes 15 hours at least in a car)at my house in syracuse. He had that name before that bike ride but he earned it in about fifteen ways. I'm from Milwaukee and was a big Method fan. 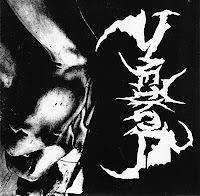 Jim (Survivor) was actually the vocalist for Method, not the guitarist. He did play guitar for Kill the Slavemaster though. I have some photos of Method shows if you're interested.